December 7th 1903 – Doyle Fire District was finalized. October 13, 1904 – John Rohr, J.P. Sherrard, and James Devine were the first three fire commissioners and a treasurer for the first district. Gottlieb Koch was elected district treasurer, with J.P. Sherrard being appointed the first president. The first chief elected by the taxpayers of the Doyle Fire District was Andrew Napieralski, a position he would devote the next 25 years of his life to. April 3rd 1911 – Doyle Hose Company No. 1 was established. The company was under guidance of President John Rohr, and Chief Andrew Napieralski. The first piece of firefighting equipment consisted of a two-wheel cart, which is pictured below. This is still restored at the Fire Station. April 10th 1924 – The Doyle Fire District grew by one more company as sister company Doyle Hose #2 due to the population of Cheektowaga growing from 7,500 inhabitants in 1911 to 15,000 in 1924. 1926 – Doyle Hose Company #1 was able to purchase a new American LaFrance fire Truck, the company donated to their sister Fire Company their recently purchased Hahn Motorized Fire Truck and the District was now protected at both ends of town. 1946 – The Fire District purchased a 750 gallon MACK pumper, considered at that time the Cadillac of the industry. October 30, 1954 – Doyle Hose Company No. 1 celebrated its 50th Anniversary with a membership of 104 people, up substantially from its original membership of 10 in 1904. 1959 – The Fire District built a large three bay engine room, along with firemen’s quarters and meeting rooms. With the anticipation of equipping the fire district with the finest firefighting equipment, the old engine room was renovated and made into a community hall for the people of the Doyle Fire District. The new engine room was equipped with a First Aid Vehicle and in 1960, a 65’ Aerial Ladder Truck. The smaller, more efficient First Aid vehicle made an immediate impact in the fire service. Fire trucks were initially used to cover first aid calls, but they were too large and too costly to operate for first aid calls, thus necessitating the need for the smaller, more efficient rescue vehicle. 1968 – Board of Fire Commissioners approved the purchase of a 1250 gallon CRUSADER pumper and after 11 years of faithful service, the original rescue vehicle was replaced by an INTERNATIONAL FIRST AID truck in 1971. After 32 years of faithful service, a new pumper was purchased to replace our “OLD MACK” pumper. The training and new equipment was very much needed in putting out many major fires, such as St. Josaphat’s Church, the Immaculate Heart of Mary Children’s Home in which the caretaker lost his life, the Buffalo Fertilizer Company, the Wieczorek homestead fire and explosion that took the life of brother fireman Henry Ledwon, Eastern Auto Forwarding Company, the Anchor Block explosion in which numerous injuries and deaths occurred, along with the total devastation of the Super Duper Food Market at Harlem and Viola. Special equipment was also needed in putting out the spectacular fires at local lumber yards and auto parts dealers on William Street. Without the updated and advanced equipment, the raging house fire at 55 Fairoaks in 1978, the Forks Lumber Fire in 1979, and the June 4th Mutual Aid Fire at the Idylwoods Apartments would have resulted in much property loss with possible deathly results. April 28th 1979 – Doyle Hose Company #1 celebrated its 75th anniversary. May of 1979 – Fire Company dedicated a new pumper. 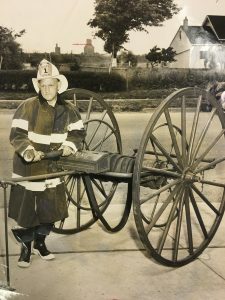 Summer of 1986 – Chief Frank Pagano was elected “Man Of The Year” in the Southwestern, Western and Erie County Firemen’s Associations for his heroic efforts. 1989 – Chief Robert Higgins was named “Man of the Year” by the William Street Taxpayers Association and the Empire State Rescue and First Aid Association for heroic acts of bravery in the line of duty. September 10, 1990 – Doyle Hose Company #1 was proud to welcome their first female firefighter, Lisa Ann Kostelny. This paved the way for many fine lady Firefighters to join Doyle Hose Company #1 with the 2004 roster showing four dedicated female firefighters. 1999 – Newly elected Chief Charles “Chip” Schnurstein proposed to the Doyle Fire District a directive to adopt the AED Program “Automated External Defibrillation”. Doyle Hose Companies #1 & #2, Doyle Fire District, Western Regional EMS and Dr. Lakomy of St. Joseph’s Hospital entered into agreement for this service. May 1, 2000 – Two young firemen, Jay Napieralski and Joe Fitzgerald were recognized by the Leonard Post for their life saving efforts, while WNLO – Channel 23 honored firefighters Michael Mazurowski and David Crone for delivery a young child into this world during an emergency. April of 2003- Don Szumigala, was nominated for the Community Heroes Award, which recognizes members of the fire service for their outstanding service to their community. From a small wooden election booth in 1904 to a four bay, two story brick building in 2004, the spirit and dedication of the Doyle #1 fireman has remained the same. The fire hall and equipment is constantly changing to provide the community with the best trained volunteer possible, while the newly renovated fire hall complex has provided a second home for its members. During the 100 years of Doyle Hose Company No. 1, the members always believed that Courage is the greatest of all virtues, because if you don’t have courage, you may never have the opportunity to use any of the other virtues. To the courageous men and women of Doyle Hose Company No. 1, both past and present; for your unselfish dedication to duty, we thank you. Doyle Volunteer Hose Company #1, would like to thank all the people in the Doyle Fire District for their support throughout the years, helping us grow into an efficient and well respected community volunteer fire company.